We’ve been putting our customers to sleep for over 30 years! We’re proud to announce the launch of BURLINGTON MATTRESS, Our NEW Specialty Sleep Store right next to our BURLINGTON FURNITURE Store. We’ve used our 30+ years of experience in selling mattresses to create a unique and welcoming environment where you will feel comfortable in exploring different mattress options until you find the one right for you. 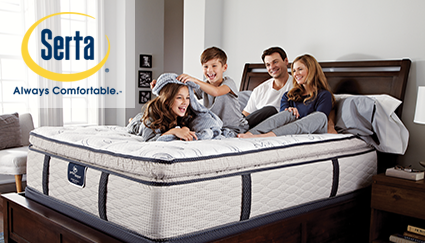 Our selection of mattresses have been selected from some of the most trusted brands in our industry. Our team of mattress professionals are experienced and well trained in providing sleep solutions that work for you. I really needed a new mattress and definitely waited too long! The thought of buying a new mattress with so many choices was overwhelming. The showroom was easy to figure out and with the help of a dedicated sleep expert I was able to pick out a new mattress that felt great and fit my budget. The best part was that it was delivered the very next day. My only regret was not finding these guys sooner. We had the most incredible experience at Burlington Mattress! What a place! Not only did we find the perfect mattress that fits both of our sleep needs, but we found the perfect bedroom furniture at their adjoining store, Burlington Furniture! So worth the trip. After checking out two or three other mattress stores we are glad we found Burlington Mattress. We had a sense of what we wanted after doing some research and was pleased to find such a great selection of mattresses in a brand new store. The staff was professional and listened first before sharing their knowledge. We felt comfortable making our purchase and have been sleeping better now for two weeks.